Observation - lichen - UK and Ireland. Description: Lichen observed on Willow tree by the Whitewater river. South side of tree, not sure if it's lichen growing on lichen or fungus on lichen. Lichen observed on Willow tree by the Whitewater river. 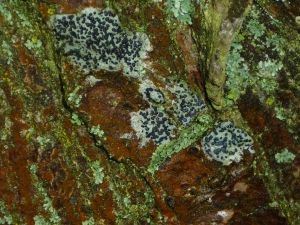 South side of tree, not sure if it's lichen growing on lichen or fungus on lichen.